This Cuban band founded by famous Cuban musician Juan Formell is one of the most reknown Cuban bands and maybe one of the most meaningful. It has been around since 1969 and had many different line-ups. Musically is stays close to its Cuban roots playing many Afro-Cuban style songs like salsa, timba, son and cha-cha-cha. As a drummer I'm very interested in Afro-Cuban music because of the great rhythms and percussion but also because its music reflects a country with beautiful people. I've visited the island twice and it has certainly captured my heart. So I was really looking forward to this performance. 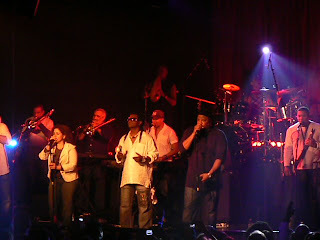 The band has a big line-up with three keyboard players, a couple of horns, bass, guitar, violin, three singers, guiro, conga player (or conguero) and a very busy drum player, band leader Samuel Formell the son of Juan Formell, playing drum set, timbales, bongos and some other percussion instruments. As a result the mix (of all the instruments) needs close attention however this unfortunately is not the case. A band like this has many high pitch sounds and few low but this is not balanced properly. The result is a lot of noise and a very chaotic sound and many instruments (like congas and violin) can't be heard at all.